Enter the SOREL Fearless Women Twitter Contest through November 3rd. The contest features SOREL's Cate the Great™ boot, which I love to wear with a sweater and denim leggings for those rainy or snowy cold days. This boot honors Catherine the Great, who ruled Russia as a single woman, expanding and modernizing the empire. The waterproof full grain and suede upper is whipstitched by hand and features faux fur around the cuff. A plush recycled felt InnerBoot and bonded felt frost plug combine to keep feet warm down to -25º below zero. 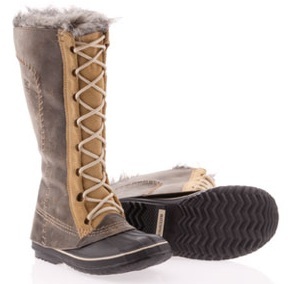 The contest also features SOREL's Joan of Arctic™ and Sorelia Earhart™ boots. Click here to learn all about the contest.